Sometimes you need to lay very still, be quiet, empty your mind and let the full moon reach across the sky through your window and kiss you softly on the face. And then let God write poetry through you. 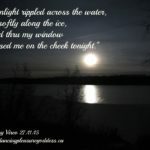 On that late November Canadian winter night, early in the evening at around 7 pm as the moon was emerging on the horizon, in our little cabin by the lake in northern Alberta, my beloved and I crawled into bed super early for a good long warm snuggle. My beloved breathed me open. There was so much space in me to receive. I had no thoughts. I was happily in the no mind zone. The words entered me slowly through the light of the moon. They stayed with me and played with me all night. The words were still there in the morning when pen met paper. The words were wrapped in the kiss. Or perhaps the kiss was wrapped in the words of the moonlight poem. 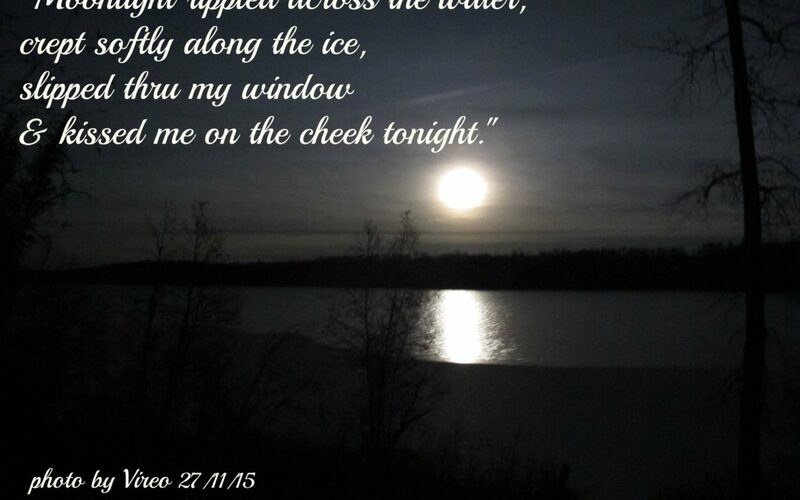 Moonlight rippled across the water, crept softly along the ice, slipped through the window and kissed me on the cheek. It was almost the end of November and yes, the lake was still not even close to being completely frozen. Highly unusual. Later as I lay wrapped in the arms of my beloved, moonlight tickled my back and lighted on my lover’s lips. The tickles and playfulness of the moon made me laugh. Laughter rippled through me and then I giggled with delight. Such pure innocent joy the moon evoked in me. I had to recite my poem to my beloved as we were wrapped as one in the light of the full moon. Bedtime poetry. It made me laugh. Then I recited the moonlight poem again and again. Silence returned. We witnessed the moon move across and higher up into the sky. A while later, my beloved grabbed me, pulled my lips to his. Long deep sensual rippling moonlight kiss. Joy erupted in me in bubbles of laughter. I laughed myself to sleep with the poem still bubbling softly around and within me. Deep inner peace.